Littleton’s chic new négociant winery showcases a signature collection of “craft wine” on tap. Colorado may be known for its craft breweries, but wineries are poised to be the state’s next burgeoning booze industry. 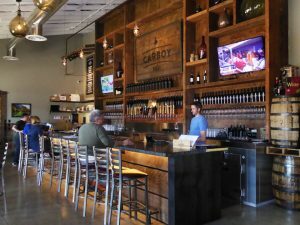 Case in point: Carboy Winery, which opened in Littleton in 2016. Carboy is the brainchild of restaurateurs Eric Hyatt and Craig Jones—the duo that assumed ownership of 43-year-old Angelo’s Pizza on 6th Avenue in 2013, and updated it to Angelo’s Taverna—as well as sommelier Kevin Webber. Carboy employs the négociant concept, an Old World tradition by which a merchant purchases the bounty of small growers and winemakers and repackages the resulting vino under his or her own label. Carboy serves up unique varietals—on tap!—as well as delicious eats from chef Gabriel Aragon of Angelo’s Taverna, which has a Littleton outpost adjacent to the winery. The Space: Carboy is housed in a spacious, industrial-chic building located just west of Santa Fe Drive. The gleaming interior is dominated by an enormous, wooden back bar, whose centerpiece is a long series of taps used to serve the house wines, as well as several draft beers. In addition to a dozen comfy stools behind the long bar, the facility has 10 high-top tables and outdoor patio seating. The Grapes: Like many Old World wine merchants, winemakers Tyzok Wharton and Christopher Christensen source grapes, juice, and already-fermented wine from around the globe, including Oregon, California, and New York, as well as several regions in Argentina and Italy, and then bottle, blend, and/or age them to create their own products. The Wine: To take advantage of the best available fruit, the winery features an “ever-evolving wine list” that includes a selection of both reds and whites, such as the 2015 Chardonnay, which has a beautiful, golden color and a mild pear aroma. Because most of Carboy’s wine is tapped from kegs rather than bottled, it is not exposed to oxygen—which can lead to a loss of flavor and aroma—until it’s served. Buzzed Trivia: Carboy Winery is named for the narrow-necked glass storage containers traditionally used for carrying and fermenting wine (and other alcohol). Instead of lugging around bottles, you can purchase an environmentally friendly one-liter carboy, which holds the equivalent of one-and-a-half bottles, or a larger flask, which holds three bottles. Bring the bottle back for a refill at any time. Taste it: The winery is open Sundays through Thursdays from noon to 10 p.m., and Fridays and Saturdays from noon to 11 p.m. Visitors can taste three wines for $10. If you enjoy whites, try sampling the 2015 Sauvignon Blanc, which has a subtle nose and slight green apple flavor. If you prefer red wines, don’t leave without trying the Vin ’59, a red blend whose delicious combination of Malbec, Syrah, Merlot, and Grenache appeals to a wide range of palettes. Carboy also serves up a menu of small plates to perfectly pair with the wine, including a baked brie and various charcuterie boards. Take Home: Since the carboys of wine stay fresh for about four days, bring home a varietal that you didn’t get to try onsite, such as the flavorful Merlot, which has a beautiful ruby-red color and a lingering, spicy finish, ideal for warding off those last winter chills.